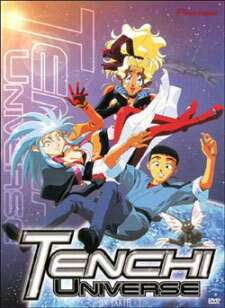 Watch Tenchi Universe Episode 17 English version online and free episodes. Anime Episode guide, Chapter Tenchi Universe Episode 17 English dubbed Drifting Away For Ryoko, things have never seemed bleaker. She placed her faith in Tenchi, only to end up losing him to Sakuya, and now, as she morosely wanders the streets, she finds herself pursued by an unseen foe! But just as Ryoko reaches her lowest ebb, she finds an unlikely ally in the form of Hotsuma, who proposes that the two of them leave the Earth and form a crime partnership together! Can Ryoko find a good reason to stay on the Earth, or will she accept Hotsuma’s offer and break the bonds that tie her to Tenchi and the gang?